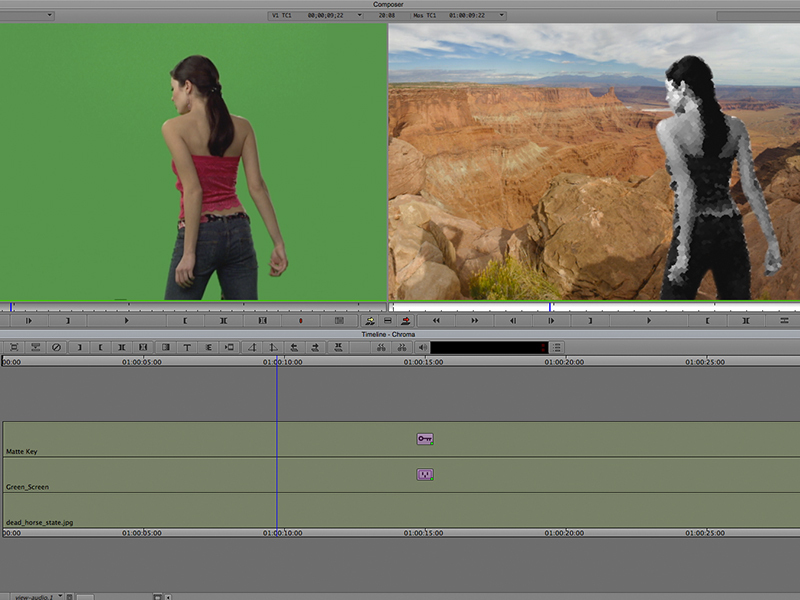 Generating a chroma key with an effect on the foreground. A reoccurring complaint about how effects work in the Avid Media Composer editing system, is that if you apply an effect to a key, you end up affecting the background as well as the foreground. This week we'll discuss how to add an effect to the foreground only. For this example we'll add a Chrystal effect to the foreground of a chroma key. Start out with three video tracks in your sequence. Place your background on V1 and your green screen shot on V3. Leave the V2 track empty for now. Show Alpha selected in SpectraMatte. Add the Avid SpectraMatte to key your foreground (V3) over the background on V1. In my case, I'll be keying my foreground over a shot of Dead Horse Point State Park in Moab. 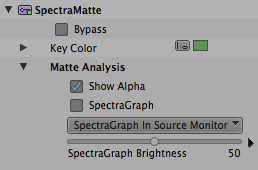 Once you've adjusted the chroma key to get the best separation possible, select the Show Alpha checkbox in the Matte Analysis effect parameter. Copy the foreground, without the SpectraMatte effect onto V2, this will be the fill for your matte on V3. OPTION-drag a Matte Key effect onto V3, this will nest the SpectraMatte inside the Matte Key. The Avid timeline with the Avid SpectraMatte nested in a Matte Key. Another complaint about the Avid editing system is how it treats alpha channels. Avid treats alpha mattes the opposite of everyone else. Instead of the white being used as the key for the foreground and black used for the background, Avid sees the white as background and the black as foreground. Which is strange since the alpha of the chroma keys in Avid are correct. 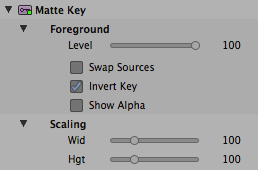 Invert Key selected in Matte Key. Because of the way Avid looks at alpha mattes, select Invert Key in the Foreground effect parameter of the Matte Key. When you monitor V3, the result will look like the original chroma key. The difference being you are now free to add effects to the foreground track. For this tutorial, we'll drop a Chrystal and a Color Effect on to the foreground on track V2 . Using the Matte Key to do the composite instead of depending on the chroma key effect, allows you to manipulate the foreground without affecting the background. This simple tutorial is intended to give you the basic concept of what you might be able to accomplish when you generate a matte key from a chroma key in the Avid Media Composer. I hope it is helpful in whatever application you may need. I'm using some footage with a semi transparent sheet being held by a model. When I apply the matte key over the spectramatte I get a lot of green spilling through from layer two which I am then unable to remove. How can I deal with this problem? The key looks good with just the spectramatte but is then made worse by adding the matte key. I added another spectramatte on V2 and adjusted that. Fixed the problem. Thanks for the tutorial! Anyone got a way to apply Animatte to a Spectramatte key that moves with the Spectramatte's position and rotate moves? Easy on Shake, Nuke and Flame, but I haven't figured a way other than using Paint on the clip it self prior to applying Spectramatte. I then paint green where I would have preferred to mask with Animatte. This is an OK work-around, but often has a little green or grey fringing around my paint shape, but at least the mask appears to move with any moves done in the Spectramatte effect. Obviously if I put Animatte under Spectramatte, the BG clip moves with Spectramatte's moves, too! Any workarounds worth trying, please let me know. And for those who ask: why not use Nuke, then?, well, you could, but then i'm only doing a demo/temp for the edit which will be replaced later when we lock the cut, so it's quicker, and all the clip data is at our fingertips for when we make EDLs and AAFs for the VFX vendor - Plus we don't have to export clips to bring into Nuke etc. Great tutorial, by the way. Forgot to add that to my note above! Thanks Jonno, have you tried Avid FX? I'm not sure how it translates to EDL and AAF files, but it works within the Avid timeline (no export / import of media).